This chapter examines the ways in which the 2007 global economic crisis has influenced firm relocation factors. Firm mobility constitutes a dynamic process, with its aspects changing in response to significant broader processes, such as globalisation. Specifically, the recent crisis has modified the socio-economic conditions under which firms operate. In order to examine the crisis-driven changes in firm mobility, this chapter employs a comparative analysis of the pre- and post-crisis relocation of Greek small and medium-sized companies to Bulgaria, which has recently increased. Greece is at the epicentre of academic and political debate in Europe, being the European Union member state mostly affected by the crisis. 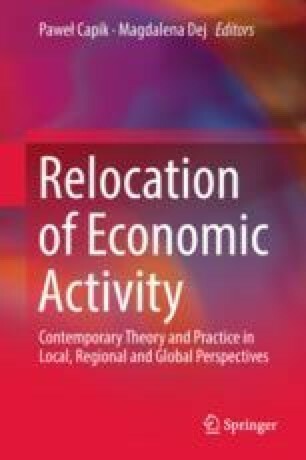 In the context of the changing economic and institutional conditions, it is demonstrated that the significance of the firm relocation factors, such as labour cost and level of demand, records considerable differences between the pre- and the post-crisis period. Bank of Greece. (2017). Online database. http://www.bankofgreece.gr/Pages/el/Statistics/default.aspx. Accessed February 11, 2017. Eurostat. (2017). Online database. Available at: http://epp.eurostat.ec.europa.eu. Accessed January 28, 2017. Labrianidis, L., & Vogiatzis, N. (2013). Restructuring in SMEs: Greece. http://www.eurofound.europa.eu/publications/htmlfiles/ef12475.htm. Accessed April 14, 2017. Ministry of Finance. (2017). Online database. http://www.minfin.gr/portal/en. Accessed May 19, 2017. Transparency International. (2014). Corruption perceptions index 2014. http://www.transparency.org/cpi2014/press. Accessed February 22, 2017. Union of Hellenic Chambers. (2016). What pushes out firms from Greece? (in Greek). Press release in the 9th May 2016. http://www.uhc.gr/newsite/info/pdf/2016/09.05.2016.pdf. Accessed January 17, 2017. Wall Street Journal. (2015). Greek shipowners prepare to weigh anchor on prospect of higher taxes. http://www.wsj.com/articles/greek-shipowners-prepare-to-weigh-anchor-on-prospect-of-higher-taxes-1443520314. Accessed March 3, 2017.